Russian Emergency Ministry employees are seen among the wreckage of a crashed plane at the Rostov-on-Don airport, March 19, 2016. 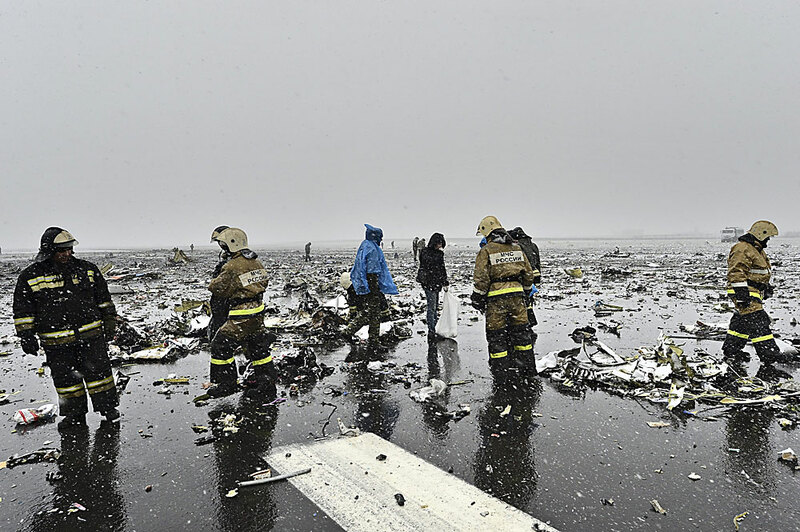 Experts have managed to sort out the problem of the damaged cable of the cockpit voice recorder from the Boeing that crashed in Russia's Rostov-on-Don; they have already started copying the information contained in it, an Interstate Aviation Committee official told Interfax. "It became known one hour ago that the problem with the connecting cable was eventually solved and the information is being copied. This process may go on until tomorrow. Tomorrow they will probably start the decoding," the official said. The decoding of the flight data recorder may take a few weeks, he added. The Boeing 737-800, en route from Dubai to Rostov-on-Don, crashed on March 19 about 250 meters short of the runway while attempting a landing. All 55 passengers and seven crew members were killed in the disaster.